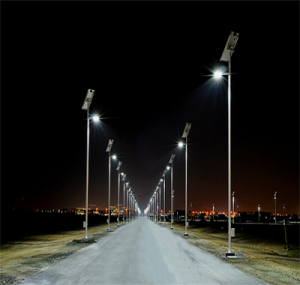 How to Design Solar Led Street Light System? Solar technology is not a new technology, it was developed in 17th century B.C, and this technology has marked its presence in both developing as well as developed countries. Electric Street lights consume more energy as they use HD lamps. Today we have everything that work with solar energy like solar-powered buildings, vehicles, solar LED street lights, etc., for energy conservation. Nowadays a new range of solar LED Street lighting make their presence felt everywhere and these lights are environmentally friendly and are easy to install and give high-intensity LED output. The solar LED street lights system convert sun energy to electricity and the system is prompted to turn on as the darkness approaches. Therefore, these lights automatically switch on after the sunset and after sunrise it switches off. In solar street lights, the solar panel is one of the most important parts, and it is also known as solar photovoltaic cell. These cells are of two types: poly crystalline and mono crystalline. Compare to the poly crystalline, mono crystalline conversion rate is higher. Solar panels use light energy from the sun used to convert solar energy into electricity, which can be used to run many applications. Electrical connections are made in series to accomplish an output voltage and to provide a current facility connections are made in parallel. The majority of modules use silicon or wafer based crystalline silicon but most of these solar panels are inflexible. In modern solar street lights, LEDs are used as lighting source and LED provide much brighter light with lower energy consumption. The energy utilization of LED fixture is lower than the HPS fixture, which is generally used in traditional street lights. Compare to the other HD lamps, and these lights do not emit light in all directions. The directional uniqueness of the LEDs will affect the design of lamps. The output of the single LEDs is less than the other lamps like compact fluorescent and incandescent lamps but a set of LED lights gives bright light than these two. LED lights offer many benefits like Long life, durability, Eco-friendly and zero UV emissions. Rechargeable battery is a type of electrical battery or accumulator and its electro mechanical reactions are reversible so it is called as secondary cell. Usually, there are two types of batteries: lead acid battery and gel cell deep cycle battery. 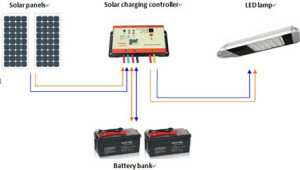 In solar LED street lights, a battery is used to store electricity from the solar panel during the day time to provide energy in the night time. The capacity and lifetime of the battery is very important as they affect the backup power days of the lights. In solar LED street lights, a controller is very important as it usually decides to switch on or switch off the lighting and charging. Some modern controllers are programmable and are used to decide a suitable chance of lighting, dimming and charging. The Controller consists of a battery charger, a secondary power supply, a Led lamp driver, a driver, a protection circuit and a MCU. The controller also controls the battery from overcharging and under charging conditions. By receiving the power from solar panels it continuously charges the battery in day time and while in evening it supplies the battery power to set of LED street lights. For every street light, a strong pole is necessary, especially for a solar street light, there are some components like fixtures, batteries and panels mounted on the top of the pole, and input power consumption is 7.2 watt (LED). In solar street lights, the input operating voltage is 12V DC nominal system voltage, and the light output at the height of 12 feet is min of 09 LUX (unit of luminance). The battery box, Led light and solar panel are all fixed on the top of the pole and they are interconnected with cables. The cable for this LED system includes a PV module to the controller, and from controller to the battery and lamps. The cable size and lengths depends on the current being carried to the lights and the height of the pole. With assembling all the above components into a one integrated system results the complete solar LED light system which uses sunlight energy to power the LED lamps fitted on street poles. Require fewer systems for installation. Offers high lighting output when compare to the conventional lights. Requires less time for installation and needs fewer systems. Offers Long shelf life and low maintenance. Comes with two year full system warranty. Initial investment is high when compared to the conventional lights. The dust, snow or moisture can mount up on the PV panels, and thus reduces the energy production. The rechargeable batteries need to be replaced several times. Solar system costs reasonably high, and therefore,, the risk of theft is higher. This is all about the solar LED Street light and its applications. We hope that you have got clear understanding of this topic, and if you have any doubts on this topic, you can contact to us. And, don’t forget to post your views and feedback on this article in the comment section below. 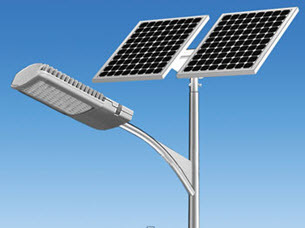 The solar led street light system is environment friendly sorce of power. Use of solar led street light system is increasing day by day in every part. Please check the user friendly website http://www.edgefxkits.com for complete details in the kit content section and go through the FAQ for details. Here is one more link Tarun that deals in eco friendly techniques and their installations. hello, I come to your blog for the first time and read all the information about solar energy street light, its really informative.We are manufacturering and suppliying all solare energy product with a wide rang . Sorry, we are not dealers and don’t sell any component. You can buy similar projects with documentation in our website.